"Well, here I am in Tuy Hoa, a small city on the central coast of Vietnam. I'm in the 'house' (its like a workshop with an apartment above it) of some random old people that I just met, stealing their internet. Actually its the house of the parents of the husband of one of the ladies that brought me here. My boss/tour guide, I guess. I came with her and her assistant, who think its great fun to hang out with a foreigner, and keep trying to give me food and drink! Vietnamese are too kind! The train ride, which was supposed to be 10 hours, turned out to be 12 hours. Vietnam has only one train line, most of which is a single track, running north-south, so we had to stop a dozen times for trains to pass the other way. I was stuck in a very cramped cabin with a bunch of Vietnamese, trying to teach them how to play I spy, and trying to explain what a prawn was. And there was some little kid that I kept scaring, by trying to ask him his age in Vietnamese. 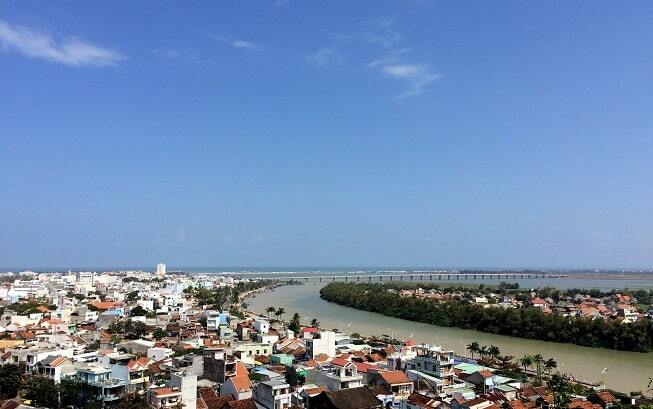 We left Saigon at 3pm, and got to Tuy Hoa at 3am." 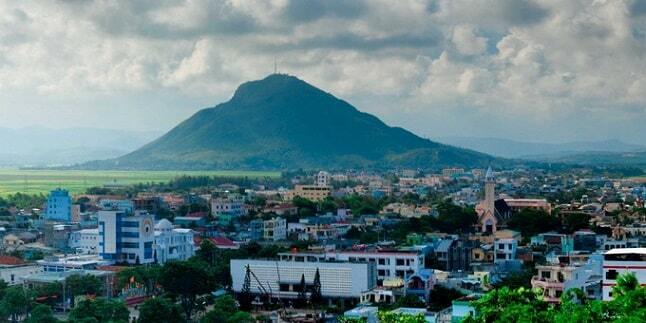 Tuy Hoa - is the capital of Phu Yen province in the south of Central Vietnam. The city has a coastline which is more than 10 km long. 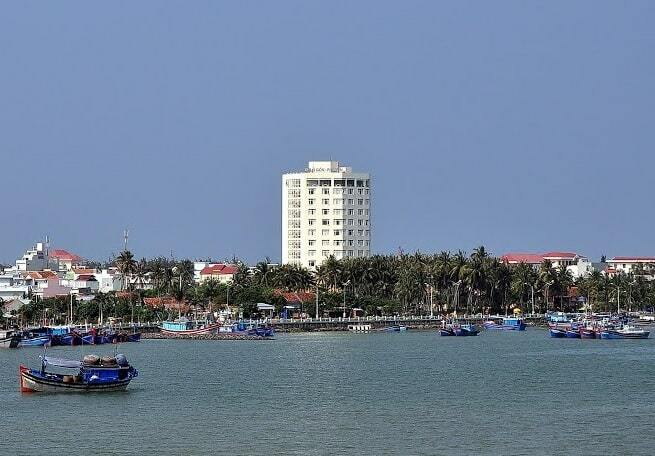 Tuy Hoa city is the center for trade, services and transport of the province Phu Yen. The city has plenty of beauty scenic spots such as Da Rang River and Nhan Mountain, Ghenh Da Dia ....... which forms a famous tourist attraction. Additionally, you can also visit a series of pagodas, namely Ho Son, Hoa Son, Minh Son, Khanh Son, Bao Tinh, Bao Lam, Kim Cang. Ghenh Da Dia is a mystery of nature. Ghenh Da Dia is a rocky area of ever five-angular rocks, stacked or adjacent. From afar it seems as if people have piled up this way. You can compare it to the honeycombs of a beehive. Ghenh Da Dia is situated 30 km outside Tuy Hoa. 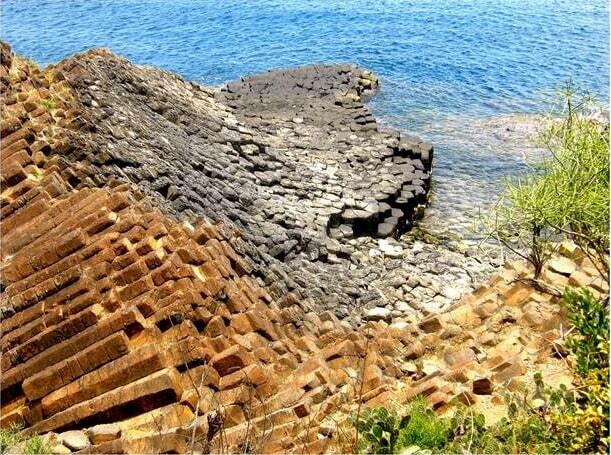 It must have been millions of years ago after an eruption of a volcano, when a lava flow reached the cool water and solidified. The field of Ghen Da Dia is one km2 and lies half sea and half above sea level. In the vicinity of these rocks is a beautiful beach with turquoise water. The place itself attracts couples, who are just married to take wedding photographs. The beach is known as "Almond Beach" where the almond trees just grow into the wild. The place is difficult to reach by land with its winding roads. Most tourists choose to come by boat across the sea. Then they depart from the port of Tuy Hoa and they can enjoy the fascinating landscape: the winding roads ashore, the islands and beaches. This trip takes two hours. Tuy Hoa is a typical Vietnamese city: low-rise buildings and crowded with people and bustling, small-scale enterprises. The city has about 250,000 inhabitants. The beach near Tuy Hoa are absolutely gorgeous! It has an advantage over some other beaches in Vietnam: one can swim here at any time of the year at sea. The beaches of Long Thuy and Da Dia are known for their pristine white sand and crystal blue waters. Vung Ro is a famous tourist center in the region and a short drive south of the city one can see many beautiful islands and visits. At 3 km from the ocean is the Chop Choy mountain, which offers spectacular panoramic views from the top; overall this is an amazing experience. You can already see the mountain from afar, as you can see at the picture. There is a large radio mast on top. This part of the coast consists of high mountains with steep walls, which extend into the sea, sheltered coves where fishing fleets are uninhabited sandy beaches that stretch from headland to headland.